Hello from down south (down further south) in New Orleans! I’m away on a work trip this week and after a day of travel, I laid in bed, ordered a big ol’ salad via Uber Eats (my first time trying it out – like Uber for food delivery, if you aren’t familiar), and consumed said salad in bed while watching This is Us. Pretty perfect evening. I’ve been here a few times but have never really been able to explore much of the city. This is my second time staying at the Windsor Court and that is something I most definitely can recommend. 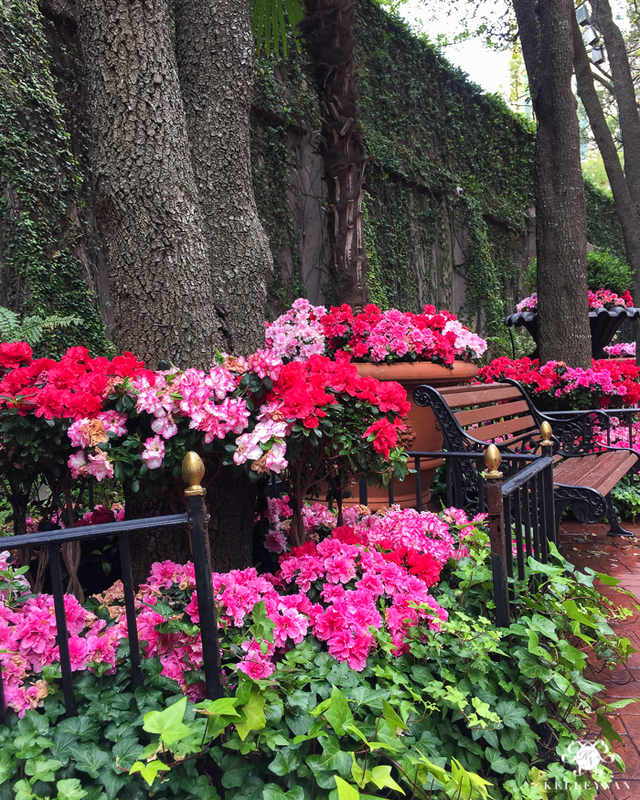 The entry almost resembles a large private courtyard; here’s a little peek of what greeted me when I pulled up in the cab. I know, right?! But, I wanted to pop in and give an update back on the home front. Remember in my under the kitchen sink organization post when I briefly referenced the foyer lighting saga? So here’s the story. I am starting to work my way through the house, slowly updating some light fixtures as we are able. If you are standing at our wall of windows in the great room, in one line of sight you can see five light fixtures that I didn’t care for. The ones where we went with the standard offerings in the interim when we were building. There are three up on the catwalk, one in the great room walkway underneath the catwalk, and then the main foyer light. The first I wanted to tackle was the entry light and I knew while I was at it, it would make sense to go ahead and switch out the other nearby light. 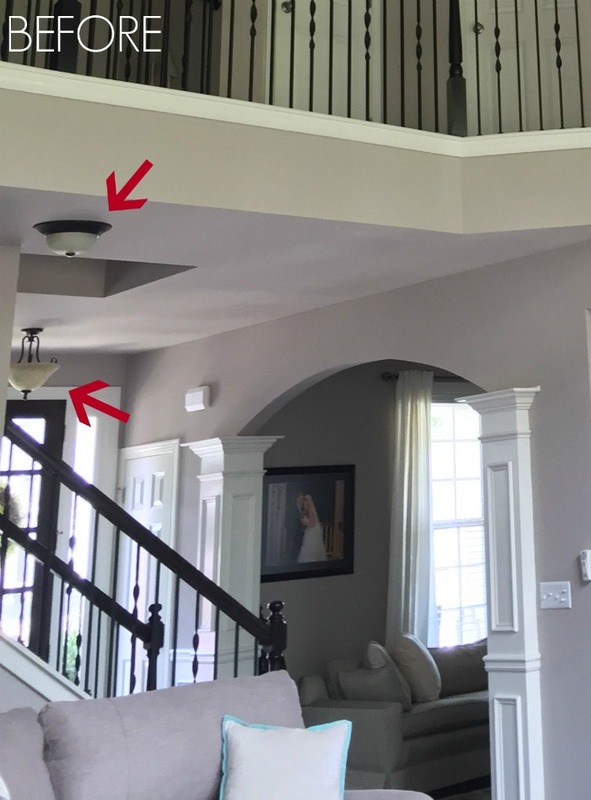 Because it is under the catwalk, I didn’t want that light to compete with what I ultimately hang upstairs or the foyer light, so I planned to switch it to a can to match the cans in the coffered ceiling. Are you still with me? Ok, good! So, I snagged this lantern I had been eyeing for a long time a few weeks ago. Because the foyer ceiling is 9′, I went with the small. So, here’s where it gets tricky – at least for us who are pretty self sufficient but are a long way from being carpenters or well versed in home improvement projects that involve cutting. 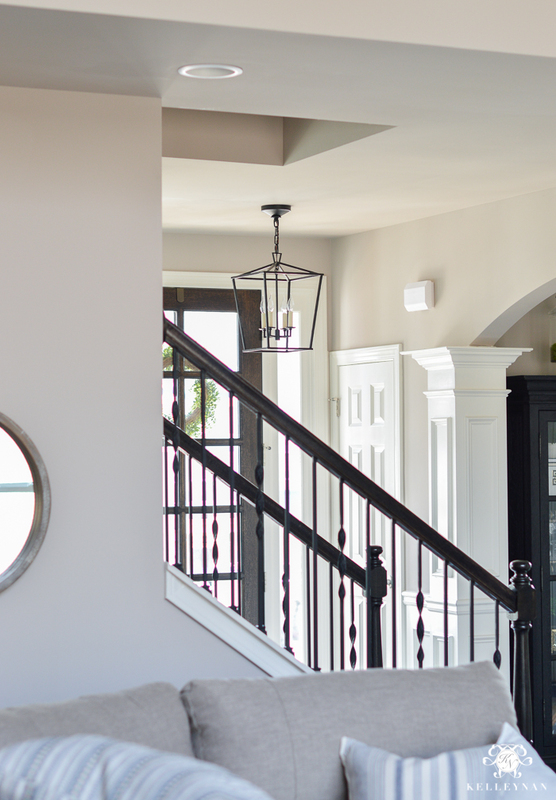 The builders centered the foyer light in the center of the room, not with the door. If we were going to hang a new fixture, it needed to be done right. My husband quickly learned his way around light boxes and and new tools; he first converted the walkway light to a can. Then, he removed the foyer fixture and set to work. There was no joist where the new light needed to go so he had to use a fan brace in the ceiling to provide support. This isn’t a DIY post (I wouldn’t even know where to start) so I’ll skip to the chase. There was a lot of trial and error between deciding the best approach, hanging, and ultimately patching the previous hole, but… IT IS FINALLY DONE! Giving the patchwork a final sanding and slapping some paint on was one of the last things I did before heading out of town. …and this is the final result. I’m so glad I decided to switch the front light into a can to really let the foyer light be the star of the show. You can tell here why we took on the project. 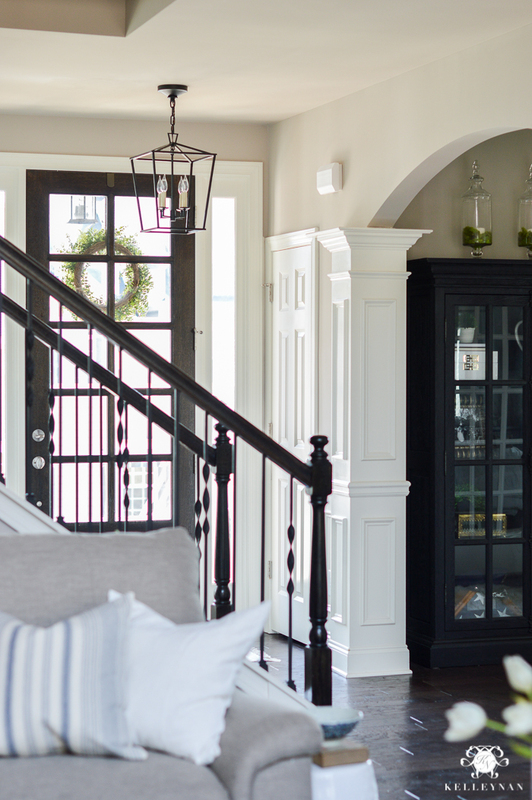 It wasn’t 100% done and I hadn’t shared the details yet so I didn’t mention it, but it even made an appearance in my recent Spring Home Tour. Did you catch it? See it back there? SUCH a huge improvement. I’m working on replacing the catwalk fixtures and when I do, I’ll share the full view of the entire lighting situation. 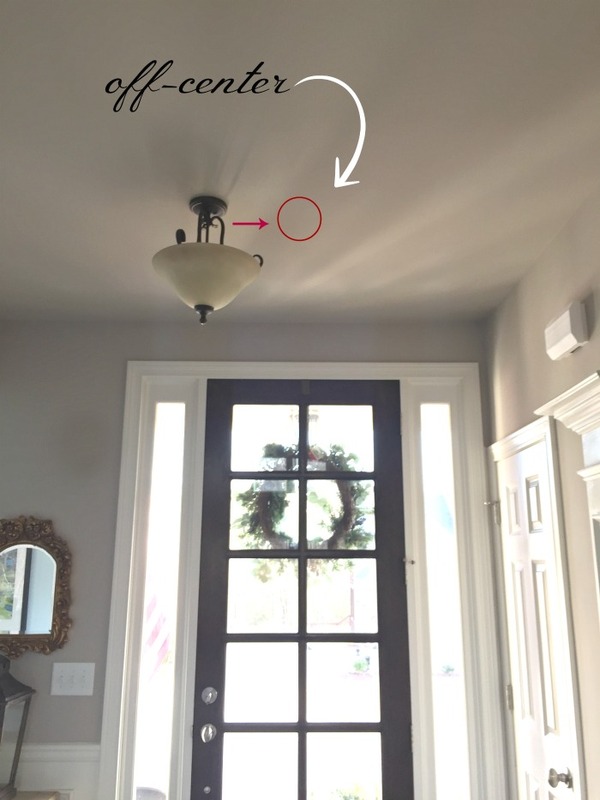 The bottom of the fixture hits just at 7′ above the floor. This was just the starting point we needed to get us moving; Dave is ready to tackle more projects with his new skill and I am ready to kick some of my “bleh” lighting to the curb. There are also a few more foyer updates that are pending (isn’t that always the case?) but stay tuned for our next round of switch ups and refreshes. Love the new light fixture! I probably would not have noticed the old one being off centered because I am always looking at all the beautiful details in your house. My question is what do you do with all your old light fixtures and decorative items that you no longer want? Thank you! I tried to ignore that haha. Some items, I sell, some I donate, some go to the basement for “just in case”. I will probably try to sell some of these light fixtures since I have several I will be switching out. Such a huge difference! You and Dave have to be thrilled. Go TEAM Lopez!!! Wow! I love the changes Kelley! Your hubby rocks! 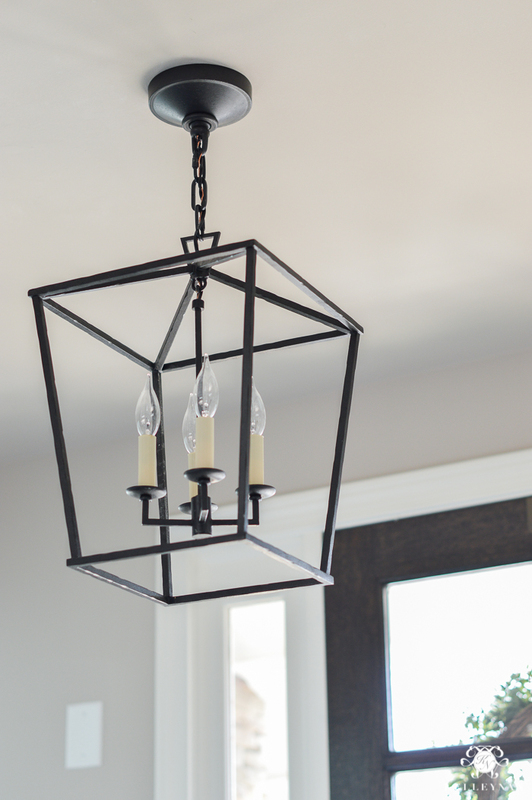 I’ve been updating some of my light fixtures too in preparation to list our house for sale. Can’t wait to see what you decide on for the catwalk. Maria, where are you moving?? Kelley it all looks fantastic! The fixture being off centre would have driven me nuts lol. I just got a very similar lantern for my ensuite reno in the gold. But I got the Millennium Lighting version. I love it. And, thanks to you, I have been cleaning out cupboards and reorganizing. PS Your hotel looks lovely. Kelly may I ask what are some of the paint colors you’ve used in your home. Love your wall colors. 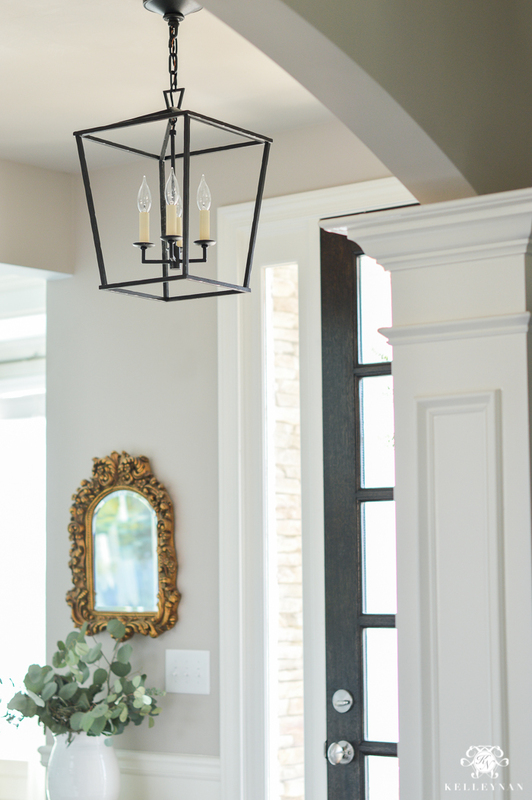 Love, love, love your new light fixture. Can you tell me where you found it? Your house is beautiful! We took our old one to Habitat for Humanity’s Restore. Great idea. My dining room fixture is off center and it drives me crazy! I might have to hire someone to come in and fix it. Judy, I absolutely would. Especially for a professional, it should not be a hard task. Good luck!! Fabulous update Kelly!!!! I have so many if those lights, it’s going to take a while to update them all but I’ve started changing them out too! You’re home is gorg! Pam, such a task but so satisfying! That is wonderful!! Very nice light but a bit pricey . It certainly made a difference in your entry. I have my eye on the Darlana lantern for my foyer as well. Are you glad you went with the small? My ceilings are 10 ft so I’m debating if the medium will look best. Good thing your husband is handy! Hi, Angela! For 10′ ceilings, I would go for the medium. If I had any more room (to make sure the bottom of the lantern is at least 7′ from the floor, I totally would have. It looks like with a medium, you would still be able to have a foot of chain. 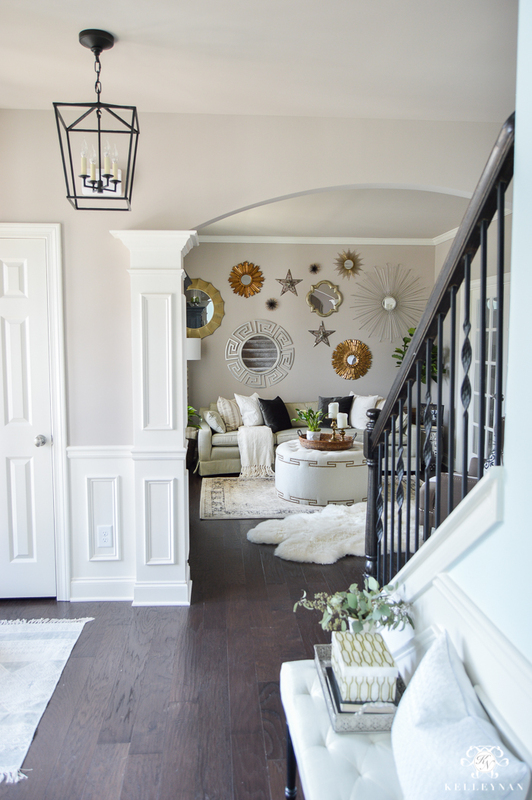 I was enamored with the darlana light and used that in my entry on my remodel. I liked the lines so much I purchased the linear style for my dining room. Love them both! Natalie I love that one too! They are so versatile. Absolutely love that fixture! It’s such a classic! Kudos to you and hubby for your patience and perseverance in making it “just right” by moving it to line up with the door and changing up the other fixture to a can light to allow this beauty to shine (pun intended). Sharon, thank you! I’m glad we went for it too! Kel it’s absolutely perfect in your entryway!! What an awesome job you guys did!! Tam, thank you so much! I am excited to see your latest update! Love the updates! And thanks for the info on where to find everything! 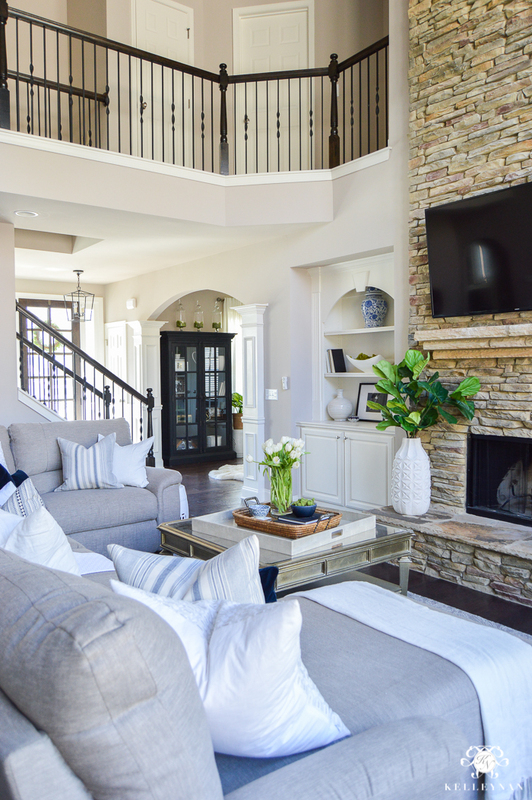 Would you mind sharing where your couch is from too! The light gray! Thank you! Beautiful! 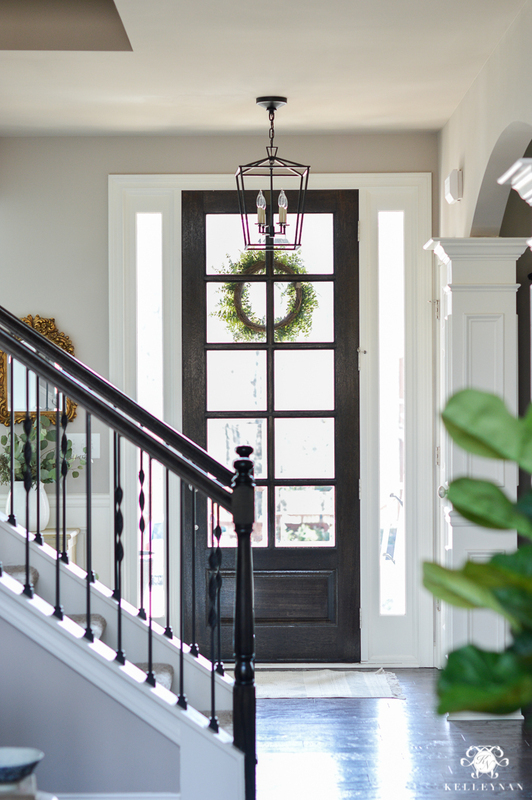 Do you have sources for your front door and the stain you used? I am looking for a new front door just like yours. Also, is your stair rail stained to match the door? Thank you!!! What size Darlana lantern is this one? Hi! Thanks for your post, it has made me think twice about the size of the Darlana Pendant I should get. I also have 9 ft ceilings, but two will be above my kitchen island which is 12 ft long only 36 wide, opening to my living which is really small! I’m worried I will overwhelm my space if I go medium! But maybe small is too small?? Also do you remember the gray fabric name on your lazyboy? Thanks for any insight and sharing your beautiful space! Thanks for your help! I have really put too much thought into this!